2019 will be an amazing year to Sell or Purchase your Yacht! To list your yacht with John Kaiser, Jr.
Email to John Kaiser, Jr.
Yacht designer and boatbuilder John 'Rex' Kaiser passed away January 8. He was 88. Rex was born and raised in Wilmington, Del., but spent many of his early years in Ventnor, N.J., where he met his wife, Claire. 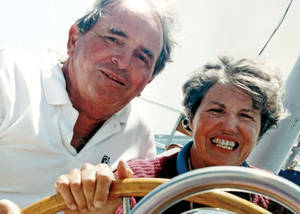 They spent nearly every summer in New England aboard their sailboat Claire. He enlisted in the Navy as a Bosun's Mate in 1945 and later attended Parks Aeronautical School of Engineering. He received his bachelor's degree from the University of Delaware and a law degree from Washington and Lee University. In 1960 he formed Kaiser Yachts, where he designed and built semi-custom cruising sailboats. His most popular design was the Gale Force. Thirty-five were built and continue to sail around the world today. In addition to his love of life, he will forever be known as a delightful storyteller.